"This is by no means gourmet, but it was tasty and the kids loved it, even the veggies! It's great way to use frozen meatballs." Stir vegetables, meatballs, apricot jam, salad dressing, and soy sauce together in a skillet over medium heat. Cover the skillet and cook the mixture until the vegetables and meatballs are heated through completely, 15 to 20 minutes. Serve over rice. 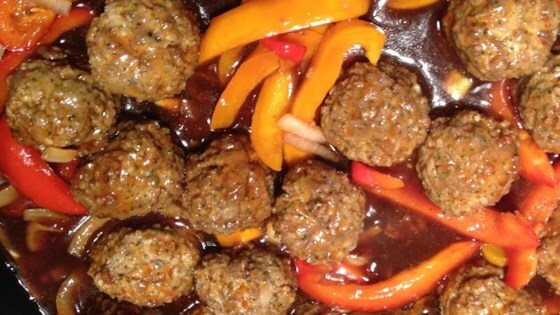 A quick and easy recipe for sweet and tangy meatballs. This was incredibly easy and delicious. Made exactly as written and served over spaghetti for a lo mein type meal. Wonderful! great quick meal, I added 1/4 cup of red pepper jelly as well, delicious. Very easy to make and a great flavor! We ate it over rice. This was fast and easy for a work night, we will definitely have it again!